Where to begin with Land Ho!? 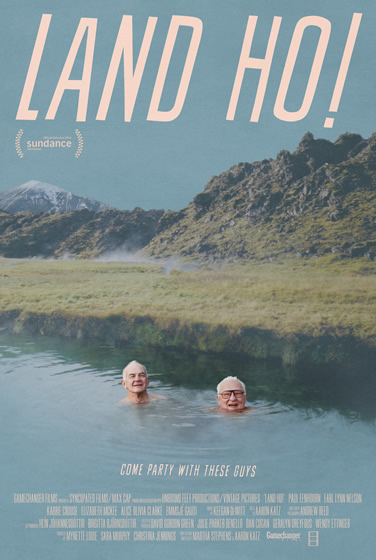 It follows two over-the-hill former brothers-in-law who go on an impromptu trip to Iceland. 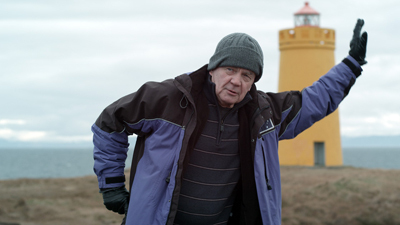 Mitch (Earl Lynn Nelson), the eccentric, unapologetically offensive one of the pair is convinced the trip will help him feel better about being forced into retirement. His other motivation is get Colin (Paul Eenhoorn) to cheer up and move on from his deceased wife and his more recent second marriage split. The two gallivant across the country as Colin remains pretty passive about everything, and Mitch seems to go out of his way to offend and annoy everyone he comes in contact with. At first Mitch’s off-color remarks and generally irksome behavior are harmless and even pretty funny—renting a huge, black Hummer to drive across the simplistic yet breathtaking Icelandic landscape? Pretty comical. But after around twenty minutes or so, his humor begins to become repetitive, and incredibly crass. Did we really need around five minutes to be spent on him ostensibly “helping out” his much-younger cousin and her friend by telling them how matronly they are dressed and how much better they would look if they wore more scantily clad clothes? Meanwhile, the girls’ reactions are surprisingly disinterested. The film doesn’t make it quite clear whether they are merely ignoring it because of how stupid the comments are, or if they are mildly indulging his comments by making no stand for themselves whatsoever. Though Colin seems slightly annoyed by Mitch’s comments, all he seems to do throughout the whole film is merely blush while shaking his head. This is mostly an issue because both Mitch and Colin as characters remain one-note for the whole movie, and the whole bit of the old man saying offensive things because he grew up in a different generation gets real old real quick. Aside from the weirdly handled sexism, the film’s other pitfall is that its overall plot seems to be underdeveloped. The true substance at the heart of the film seems to be neglected in exchange for comical bits that barely pay off. We learn that Mitch dropped the ball when his ex-wife’s sister passed and wasn’t there when Colin needed him to be. Colin hints that this affected him, but it’s vague and is never really mentioned again. After the two go on a stroll in the dark and are then unable to find their way back to the hotel, they are both forced to sleep outside. Colin wakes up annoyed with Mitch, and instead of taking the opportunity to come full circle and tell Mitch how he really feels, he complains about having had to sleep outside, and angrily walks back to the hotel. Regardless of these (perhaps) harsh criticisms, Land Ho! is ultimately a film that is fairly innocuous (barring you are not too offended by the sexist remarks). It will most likely garner the most success from an older generation that can relate better with the characters. While most of the film is not necessarily unfunny, it will only go over with those looking for a simpler, vanilla flavored summer comedy. Land Ho! opens today at the Ritz Bourse. Catherine Haas is a native Philadelphian who received her master’s in film history from Columbia University. She is a freelance film programmer, writer, and an avid pug enthusiast.